Snap, Snap, Snap go the crabs! For this week’s www.IllustrationFriday.com theme of “snap”: this blog entry is dedicated to the popular Filipino folklore character “Juan Tamad”. His name translates in tagalog (the Filipino native language) as “Lazy John”. 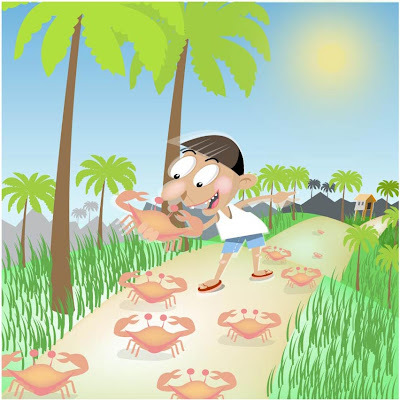 He was so lazy that on one hot summer day, he instructed a sack of crabs the way to his home instead of carrying them. What did he do when the crabs made their way?… take a nap under the Guava tree, of course. There is another story to that guava tree. He was so lazy that instead of picking the guava fruit from the tree, he sat and waited for them to fall. Now that is lazy! Have a good week everyone. I have spent some time in the Caribbean and there are crazy crabs like this everywhere on some of those islands. They kind of creep me out. Great job illustrating the story though. You are right, that is lazy. Very cool – I love your pallette, and the character is nicely realized. Fun style. Illustrator? I like the faded mountains for perspective. Fun, lively, and well rendered. I enjoy your work. What a fun story and charming image to go along with it. You have a great style. This is lovely!! And we finally get to the the whole picture of your avatar!! AWESOME!! The secret of your avatar is revealed! 😀 I love this illustration…very charming, colorful and I enjoyed the story, too.